Welcome back Jupiter! The 2003-2004 Jupiter observing season is almost upon us, so here is a little preview of what is to come. Jupiter will be in opposition (Jupiter and the Sun are on opposite sides of the Earth) on March 4, 2004. Therefore, the Jupiter observing season will begin about November 15, 2003 (3.5 months before opposition) and ends about June 15, 2004 (3.5 months after opposition). We hope many more of you will join us to observe Jupiter with your own radio telescopes. Or perhaps you can join our live Jupiter data stream online via our permanent telescopes at the University of Florida and University of Hawaii-Windward Community College. During the Jupiter observing season these observatories are nearly always online streaming data consisting of Jupiter intensity-time graphs, live audio, and sometimes live video. We will also continue our coordinated observing sessions for the 2003/2004 observing season. These are a targeted list of Jupiter and solar radio storms with high probability of observing success. Observers can interact in several ways: (1) call a toll-free number for telephone interaction with other observers, (2) join in with online chatting via free Radio-Skypipe software at http://www.radiosky.com/, (3) collect data from your own antenna and share it via a data archive on the Radio JOVE website http://jovearchive.gsfc.nasa.gov/. Please look for future emails and/or information on the Radio JOVE website about upcoming coordinated observing. If Jupiter is not for you please remember that the Sun is also a good source of radio noise bursts. The Sun has been quiet lately, but you can still try to observe the Sun. Remember to correctly phase your antenna when the Sun gets low in the sky for the northern hemisphere. See the phasing article in this edition of the JOVE Bulletin. For the last several years Jupiter has been at high northern declinations. At transit it was high in the sky for mid-latitude observers in the northern hemisphere. Jupiter is currently moving toward southern declinations. For the next several years it will be lower in the southern sky (unless you live in the southern hemisphere where it will be getting higher). This is important for Jove observers living above 25 degrees N latitude since the simple in-phase connection of the Jove dual dipole antenna, which produces an antenna beam straight overhead, will no longer work. There are two solutions to this problem. The first is to orient the individual dipoles with the wires running East-West and use the anti-phase connection (dipoles reversed with respect to the feed-point). This approach offers the simplicity of using the existing Jove antenna without modification. The result however, is a slight loss in sensitivity, due to the fact that two antenna beams are produced, one to the North and one to the South. The second solution results in improved sensitivity, and is recommended by the Jove antenna designers. It requires the addition of a phasing cable and a new power combiner. This approach generates a single antenna beam with a broad peak centered approximately 60 degrees above the southern horizon. In the original in-phase configuration, each dipole was connected to a central Tee connector using identical half-wave long coaxial cables. The new phasing cable technique retains the half-wave cable from the north dipole, but increases the cable length from the south dipole. A quarter-wavelength phasing cable is added to the existing half-wave coax line from the south dipole, resulting in a total cable length of three quarters of a wavelength. In addition, the Tee connector is replaced by a power combiner/splitter. In order to modify an existing in-phase Jove antenna all you need is the new power combiner, a quarter-wave cable, two end connectors (F-Male), and an F-female/female coupler. Simply connect the quarter-wave phasing cable between the existing half wave cable from the south dipole and the new power combiner. The following Radio Shack parts can be used to implement the phasing cable upgrade. Total cost is about $12. One 2-Way Hybrid Splitter (Radio Shack Part No.15-1234) (DO NOT SUBSTITUTE- all power-combiners are not created equal). Note: The cable length of 9.5 feet is correct for RG-6/U coax sold by Radio Shack. Their coax has a velocity factor of 78% and this value has been used to calculate the required 9.5-foot length of cable. The Jove antenna kit is supplied with RG-59/U cable, which has a velocity factor of 66%. You could use a quarter wave of RG-59/U cable for the phasing cable upgrade. If you use RG-59/U then the length should be 8 feet. Radio Shack does not sell RG-59/U and the Radio Shack twist-on F connectors will not fit RG-59/U, which is a different diameter than RG-6/U. 1. Orient the Jove dipole antennas with the wires running East-West. 3. Install the cable coupler on the end of the half-wave coax line from the south dipole. 4. Add the quarter-wave phasing cable to the half-wave coax from the south dipole, making a three-quarter wavelength coax. 5. Attach the three quarter-wavelength coax from the south dipole and the half-wavelength coax from the north dipole to the inputs of the power combiner (hybrid-splitter). 6. Attach the coaxial line from the output of the power combiner to the receiver. If you live south of -15 degrees latitude, do exactly the same thing except add the quarter-wave cable to the north Antenna. If you don't have access to a Radio Shack store you may purchase a phasing cable upgrade kit directly from Radio Jove. See the kit order form link on the Radio JOVE home page. All Jove antenna kits sold after November 2003 have the necessary parts included to implement the new phasing cable upgrade. It is important to weatherproof the power combiner and the cable coupler- particularly if the antenna will be subjected to moisture. Simply wrapping them in electrical tape will help but a better solution is to use Radio Shack Coax Sealing tape. The rubberized plastic compound sold at hardware stores to insulate tool handles makes a great outer coating on top of the tape and will help ensure complete protection from moisture penetration. Several students attending the International Space University (ISU) held this year in Strasbourg, France had the opportunity to particpate in the Radio JOVE project. These students, all of whom were taking the Space Physics course taught by Dr. Jim Green, built a Radio JOVE kit, used it for observations and analyzed their results. They also were able to compare their results with other observers who had posted their data to the JOVE archive. Ed Slane, one of the students in this course at ISU, wrote a report describing his experience. In his paper entitled, "Solar Observation using the Radio Jove System", he analyzed a Type III solar burst observed on August 1, which correlated well with an observation made by John Thomas of Mahtomedi, Indiana which was uploaded to the Radio JOVE archive. Confirmation for the solar origin of this burst came from the National Oceanic and Atmospheric Administration (NOAA) Space Environment Center web site. Slane also identified a reported X-ray solar flare that may have been associated with this burst. Type III burst observed from the ISU/Radio JOVE team in Strasbourg, France on August 1, 2003 at 14:02 Universal Time. Type III burst observed by John Thomas of Mahtomedi, MN on the same day and time. John Mannone, Visiting Professor of Physics and Astronomy, Tamke-Allan Observatory, Roane State Community College, is studying simultaneous observations of Solar Type III bursts from a variety of locations to determine whether some of the background noise in the data can be attributed to scattering due to the Earth's ionosphere and/or the interplanetary medium. In his paper entitled, "The Solar-Ionospheric Connection: Physics with the 20 MHz Antenna" he is studying whether these effects may be identified and isolated by looking for characteristic frequencies within Radio JOVE data. Like musical tones from various instruments can be identified when listening to an orchestra, each of the contributions of scattering might be identified by analysis of the frequency components of the background noise. For more information go to the following URL, http://home.earthlink.net/~jcmannone/. Time and frequency signatures are depicted for March 26, 2002 1700 Universal Time (Type III solar burst). The data used in this figure was obtained via the Radio JOVE archive. The observations were made by the following Radio JOVE participants: Jim Brown, Orangeburg, SC, USA using an RJ 1.1 receiver and a Dual Dipole; Thomas Schopp, Saginaw, MI, USA, using RF-2001C+DEMI 144-28RX receiver and a 9-element M2 Yagi; Tom Ashcraft, Lamy, NM, USA, using Sangean ATS-803 receiver (AGC disabled) and half-wave dipoles. Jim Thieman, Chuck Higgins and Leonard Garcia recently traveled to the Naval Research Lab (NRL) in Washington, D.C. to present the Radio JOVE project to representatives of the LOFAR project. LOFAR - The Low Frequency Array will observe the universe at frequencies between 10 and 240 MHz (for comparison, Radio JOVE receivers operate at 20.1 MHz). LOFAR is currently in the design and development phase but when completed it will have far higher resolution and sensitivity than any existing telescope in this frequency range. LOFAR will have approximately 13,000 dipole antennas clustered in roughly 100 stations spread over a region 400 kilometers across. There has not been a final decision on where LOFAR will be located but among the potential sites are the southwestern United States, western Australia, and the Netherlands. Along with the NRL, other members of the LOFAR Consortium are the Massachusetts Institute of Technology including Haystack Observatory (MIT/HO), and the Netherlands Foundation for Research in Astronomy (ASTRON). Namir Kassim and Kurt Weiler of the NRL presented the work they are doing on the LOFAR project after which Thieman, Higgins and Garcia gave a short overview of the Radio JOVE project to NRL staff and students. The other staff and students present also discussed their own research and how they were involved with the project. After the meeting the Radio JOVE team was given a short tour of their lab facility. A few days later the team was invited to inspect the LOFAR antenna testing facility where a prototype of an individual LOFAR antenna was being built and tested. They were able to return the favor by demonstrating the operation of the Radio JOVE system and SkyPipe software. Among the topics discussed was the possibilty of having a LOFAR antenna and Radio JOVE receiver streaming data as a SkyPipe client. For more information on LOFAR go to their website at (http://www.lofar.org/) or (http://lofar.nrl.navy.mil/). 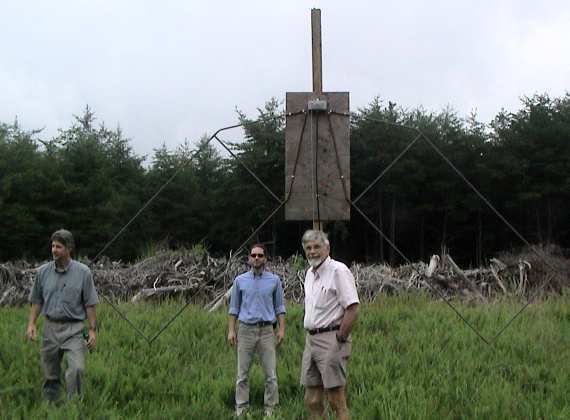 Inspecting a prototype of a LOFAR antenna are (from Left to Right) Chuck Higgins of Middle Tennessee State University and Radio JOVE; Ken Stewart of Naval Research Lab; and Bill Erickson of Bruny Island Radio Spectrometer, Tasmania, Australia. I wanted to alert you to a neat idea from an old friend and colleague. Dr. Tony Phillips is veteran Jupiter radio observer who is now doing wonderful things for NASA and the education community. He currently is the Webmaster of two excellent websites: http://science.nasa.gov/ and http://www.spaceweather.com/. He has a clever idea if you are interested. It is called spaceweatherphone.com and, for a monthly fee, it will allow you to sign up to receive phone alerts about space weather phenomena like solar flares, auroras, meteor showers, etc. He will even work with the Radio JOVE team to alert you to Jupiter storms that are in progress. Email is wonderful, but sometimes there's no substitute for an old-fashioned phone call. Sign up for our service and we'll phone you when things are happening in the sky. You'll never miss another meteor shower or geomagnetic storm just because you didn't check your email in time. When auroras appear over your hometown, your phone will ring. When the space station is about to fly over your back yard, your phone will ring. When interesting new asteroids and comets are discovered ... you get the idea. The voice you hear will be Dr. Tony Phillips telling you what to look for and when. Enjoy and I hope you have a great observing season!